petizione: Stena Line and Irish Ferries Stop Shipping Livestock to France for Fattening and Slaughter! Stena Line and Irish Ferries Stop Shipping Livestock to France for Fattening and Slaughter! Thousands of unweaned calves, young cattle and sheep are sent on horrendously long journeys from Ireland to France and beyond every year. The ferry from Ireland to Cherbourg takes 18 hours. Add to this the travel time to the port, loading and unloading time and the continuation of the journey in France before the trucks reach the designated control post where the animals can be unloaded, fed and rested. The animals are then sent on to Spain, Netherlands, Italy, Germany or Belgium. Journeys can last up to 50 hours. Calves cannot be fed without unloading which is not possible on the ferry. As they are only two to three weeks old and unweaned they should be fed every eight hours with warm milk. Without this they struggle to regulate their body temperature which makes them susceptible to illness. Furthermore their immune systems are not fully developed at this young age. They are generally underweight and unwell by the time they reach the veal farms where they will be slaughtered at just five months old. 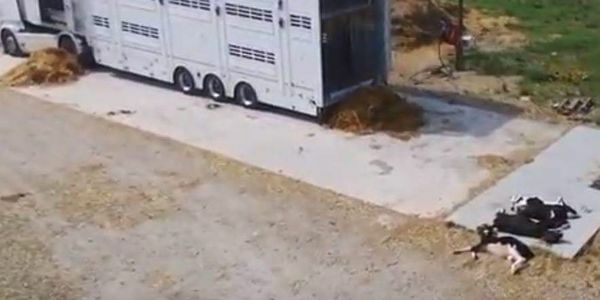 Spain exports a large amount of cattle to Libya, Lebanon and Turkey so many calves and weanlings sent there are fattened and exported on to third countries where there is little animal welfare legislation and slaughter methods used are inhumane. Thousands of sheep are exported in the summer heat for religious slaughter, often in unofficial 'pop up' slaughterhouses where there is no pre stunning. All transport is likely to be stressful to animals and risks injury, suffering and the spread of disease. We call on Stena Line and Irish Ferries to follow suit and stop profiting from this inhumane industry by carrying livestock destined for fattening and slaughter on the continent and beyond. Thank you for signing the petition. This year already over 30,000 unweaned calves have been exported to veal farms. There will be a protest this Saturday 23rd March at 13:00 at Rosslare Port. Please come along and speak out for these innocent animals. This video was taken at the lairage in Cherbourg where the calves are fed and rested after travelling from Rosslare. As you can see they don't all make it and this is clearly a normality to the truck drivers. With the festival of EID coming up at the end of August thousands and thousands of sheep will be sent to Europe for religious slaughter, often jn unofficial slaughterhouses with no prestunning. Calves and cattle are still being sent to Europe and many of these will end up getting exported on to third countries like Libya and Lebanon. Please keep sharing this petition - business listen to public pressure more than politicians do! Thank you. Here is a link to the investigation carried out by Eyes on Animals exposing breaches in regulations by Irish Exporters. Of course it wouldn't be so easy for these companies to send babies on horrific journeys if ferry companies were not willing to carry them! Please keep sharing this petition - businesses do bend to public pressure but we need more signatures! Thank you. This petition has almost reached 2,000 signatures - thank you all for signing! Calf exports have exceeded 100,000 this year - up 33% on this time last year. Please continue to share so we can reach our next goal of 5,000! This cruel industry must be stopped! Thank you.